Sole Mandate. Land’s End is a truly unique property, occupying the ultimate position at the end of Beach Road, in the world-renowned surfer’s enclave of Victoria Bay, and is offered for sale. The property is perfectly and privately positioned, nestling between the surf, the rocks and a backdrop of milkwood trees, forming an integral part of the surrounding landscape. Almost every room, verandah and balcony, provides unrivalled and spectacular, close up views of the swell and breaking waves of the Indian Ocean, gently unfolding into Victoria Bay, creating the sense of being on the deck of luxury yacht. All that can be heard is bird song, the gentle breaking of the waves and the roll of the ocean. 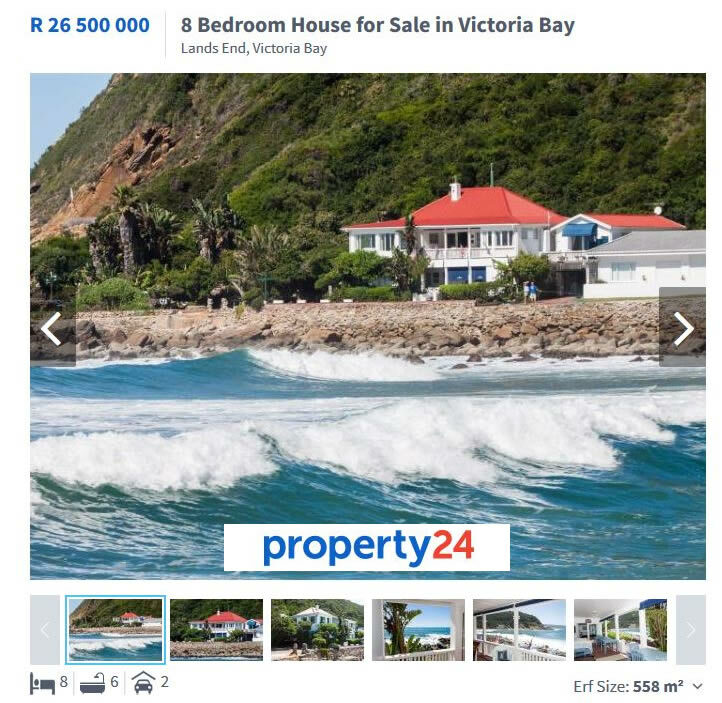 This is an exceptional property, commanding absolutely unique views over the rocks to the ocean and beach of the Wilderness beyond and occupies one of the most envied positions on the Garden Route. The property provides six private, separate and self-contained suites, complete with kitchens, and all with verandahs, decks or balconies, offering spectacular ocean views. The versatility of the accommodation offers wide appeal with a choice of uses. The residence could be privately owned, syndicated between several owners, which would provide unique accommodation to several families, or it could continue to be operated as the world-renowned guest house it is. If you’re looking for a truly unique property, on the water’s edge in this sought-after enclave, Land’s End is the obvious choice.